2013 is a year of luxurious and spa inspired bathrooms. Everyone is aiming for the modern bathroom design and when installing a shower, the walk in shower enclosure is the modern design you were looking for. These walk in shower enclosures are a great choice for both large and smaller bathroom designs. The walk in shower enclosure are stylish and elegant offering all bathrooms that modern finish. Being made from clear glass they allow light to flow freely, helping you achieve the light and bright bathroom space that ensures your bathroom has a spacious feel. Don’t get me wrong walk in shower enclosures are not only for the ultra-modern bathroom design, they blend in beautifully in a traditional bathroom. They have a clear glass pane of glass and a chrome bar which attaches it to the wall, it’s stylish, modern and minimalistic and works beautifully in any bathroom design. The biggest advantage about the walk in shower enclosures is the fact there is no door, making them great for the more compact bathroom design. You don’t have to worry that the door will swing open and knock against another bathroom item and they have a large opening for getting in and out of the shower. The walk in shower enclosures are available in three exciting design choices. There is the standard which is minimalistic in design with straight edges that fits against a wall on the one side. The second choice is the curved walk in shower enclosures, they are also minimalistic in design offering that gentle curve which enhances your bathroom when you have used rounded baths, basins and toilets. The last choice is the walk in shower enclosures with side panel. The panel ensures there is no water leakage when you need a larger shower space. Also finished in clear glass in blends in with your shower enclosure perfectly. It doesn’t matter what shower enclosure you choose, where you place your shower in the bathroom is the most important factor. You want to ensure you maximise your floor space, this is why so many smaller bathrooms choose a corner position. Take advantage of the side and inline panels available to ensure your shower doesn’t leak and that you have a stunning bathroom design that makes a statement in your home. I think one of the hardest things to do is design a smaller bathroom. In a year where everyone is designing spa-inspired and luxury bathrooms, those stuck with compact bathrooms have to decide how to make the space work for them. In a smaller bathroom environment you have to be so careful where you place your bathroom products and it’s essential you ensure that there are no products that obstruct other products. For example, if you choose a pivot or hinged shower door for a smaller bathroom, these doors could swing open and bang into your vanity or even toilet. If this happens the entry may be obstructed, this could leave you trying to squeeze into a small opening when getting in and out of your shower. This is why when choosing shower enclosures in a small bathroom space, you should choose those that don’t swing open and there are a number of options available. The sliding door shower enclosures are one of the top choices when finding a shower door that doesn’t swing open. It helps you maximise your floor space in smaller bathrooms and they are modern and stylish in design. 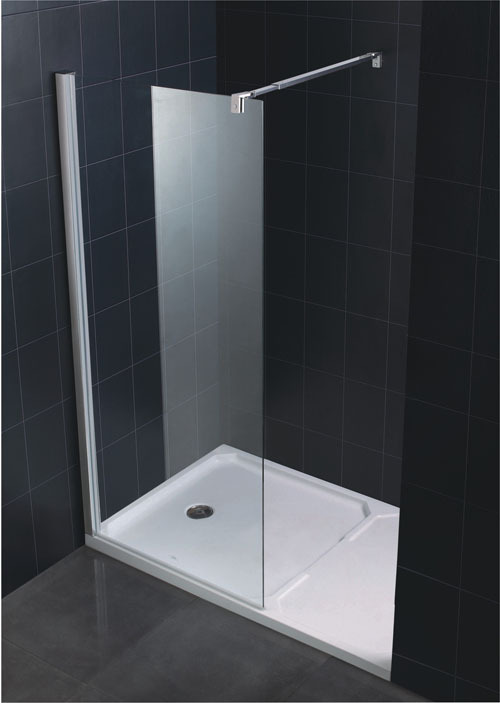 The sliding door shower enclosure slides on a rail located at the top and bottom of the shower, they are easy for everyone in the family to use and reduce the risk of water leaking onto your floor while showering. The bi-fold door shower enclosures are also a top choice. These shower doors also work on rail system like the sliding door shower enclosures except that they fold up, just like a concertina file. The doors fold in towards the shower rather than out, so they don’t compromise your floor space. These shower enclosures are also sleek and stylish and blend in beautifully with any bathroom design. The walk in shower enclosures are a modern choice and unlike the sliding door shower enclosures, these do not have any doors but rather an opening with a lip that ensures water doesn’t leak out while showering. Whichever you choose, whether it’s the sliding door shower enclosures, bi-fold or walk in option, you can maximise your floor space and ensure that your smaller bathroom layout works for you.